The timber platform at Must Farm has a brilliant combination of preservation factors that help to ensure the survival of even the most fragile of materials. One of the most delicate and impressive artefacts to survive are pieces of textile, which have remained intact for 3000 years. The presence of this seldom-preserved material has implications for research on an international level and we are very excited to have discovered our first textiles during the current excavation. 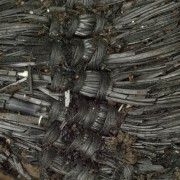 Bronze Age textiles from Britain are incredibly rare and those that do tend to survive are often in very poor condition. Pieces which are found are typically small and fragmentary, usually no larger than a fingernail. 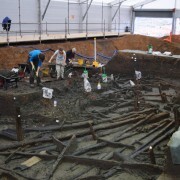 As is often the case with the timber platform, it is largely thanks to the fire that destroyed the site that the textiles were able to survive. It would seem that a fire of the intensity that could vitrify food would almost certainly eradicate something as intricate and delicate as woven fibres. 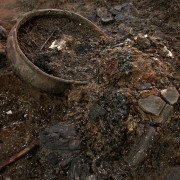 However, the blaze caused the textiles to char and carbonise. Carbonisation transforms the fibres from organic to inorganic, which prevents it from decaying (in a similar manner to the large timbers). Once this process had taken place some of this material fell into the water below, extinguishing it before it came to rest on the base of the river. The silts on the bottom proved to be ideal for supporting the textile, almost acting as a bed on which they could lie securely. During the 2006 evaluation of the site we discovered several pieces including one particularly large fragment that had been folded. 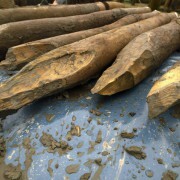 After these were examined by specialists it emerged that they were made from plant fibres, most likely from lime trees. 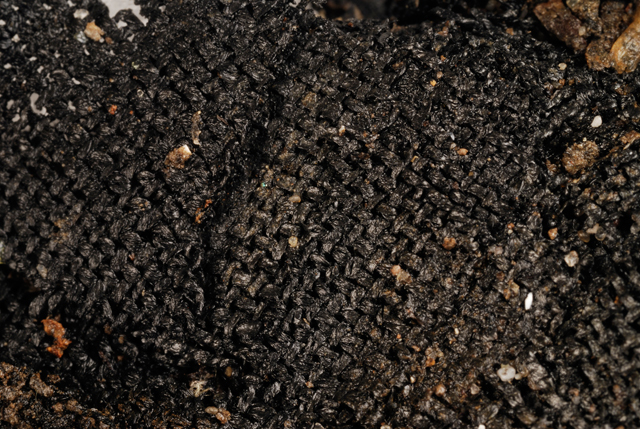 This was especially surprising as there is a fairly common assumption that most archaeological textiles would have been made using animal fibres, such as wool. 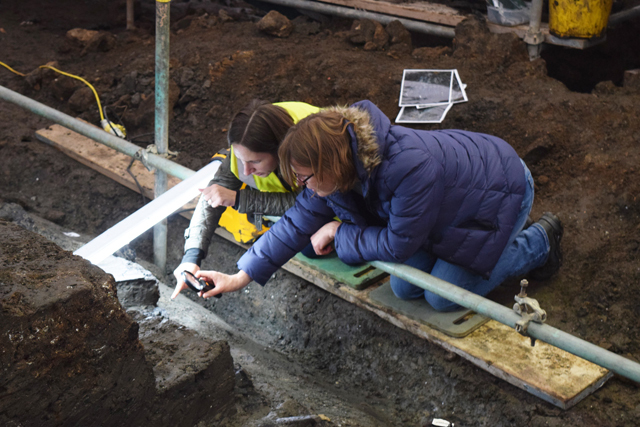 Given the presence of textiles in the evaluation, we were extremely hopeful to find more once we began the full timber platform excavation. We weren’t expecting to uncover any textiles until we had removed the burnt wood mass deposit and reached the material-rich cultural horizon. 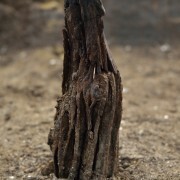 However, not long after we had begun to expose burnt timbers we came across a stunning fragment of material. 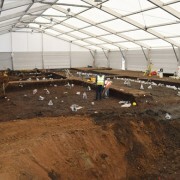 The small piece was sitting close to an area of disturbance caused by a drainage trench being cut through a portion of the site in the 1960s. 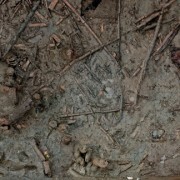 When we were cleaning the edge of the trench, in preparation to begin work on the timbers we spotted the textile. The fragment was in remarkably good condition but we still had to be exceptionally careful while cleaning it for photography and examination. We wanted to ensure that this was not part of a larger piece, so it was necessary to very cautiously excavate an area surrounding the fragment before its removal. After some careful exploration it turned out that this piece of textile was an isolated example. Before the textile was removed two of the project’s textiles specialists visited site to examine the material. Susanna Harris (UCL) and Margarita Gleba (University of Cambridge) are both specialists currently working on the PROCON Project (examining textile production and consumption in the formation of early states, using the example of Mediterranean Europe). It is difficult to be able to make any detailed analyses from a quick examination of any material and textiles are no different. 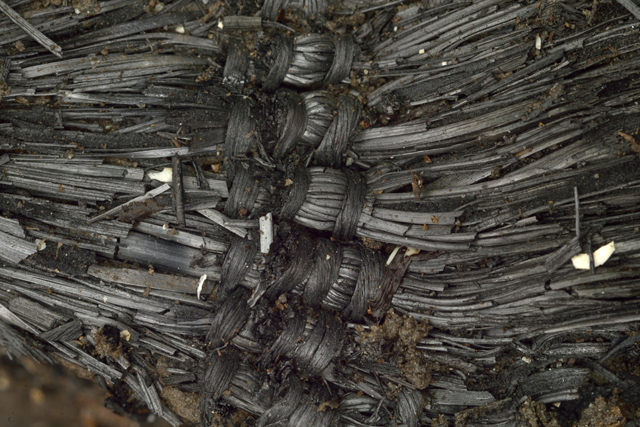 However, they noted that the textile was weft-twined (a technique similar to basket weaving) in the same manner as the examples from the 2006 evaluation. The textile was subsequently lifted and is currently in the process of conservation before it will be analysed in greater detail. One of the key research aims of the project is to examine various aspects of the textiles and what they can potentially tell us about dress during the later Bronze Age. The extreme rarity of this kind of material in such good condition from the period means that the timber platform is a site of not just national, but international, importance. However, it isn’t just the actual material which is important in understanding ideas of appearance, manufacture, usage and fastening. Associated finds may also inform us about these questions such as bobbins, glass beads, drapes and mats. The presence of textiles at the timber platform is extremely exciting for us as archaeologists as we can explore ideas of later Bronze Age life in Britain that are usually only guessed at using continental comparisons. 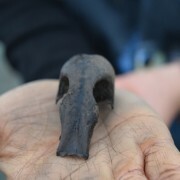 The idea that we might be able to discover what the people who lived at the site were wearing, how they were making their clothes and potentially even how they were decorated. These are all questions archaeologist can rarely even consider being able to answer. Tantalisingly, the Must Farm excavations may provide us with answers to some of these questions. 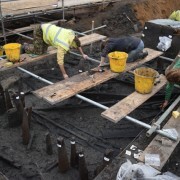 Dig Diary 7: What is the Timber Platform?